Remember the days when we had “car phones” permanently mounted in our automobiles, and we listened to cassette tapes? Ha – how dated. 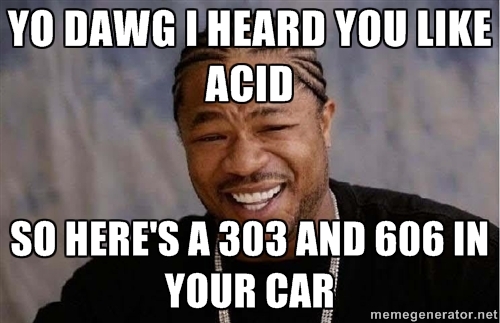 Now, we do things properly: adding a Roland TR-606 and TB-303 to the dashboard so we can make acid while we drive. Via the Facebook page of muno.pl, the excellent Polish electronic music/club site. The gentleman is called Mehdi Ansari. He runs a night called Analogue Room, here, in Dubai. It’s one of the few truly underground nights in a city full of commercial clubs. Fair play to him for the night’s success and long may it continue!